This definition of hope must be so far in the minds of people who experience tragedy after tragedy, flooding of their homes, often up to the roofs, every time losing almost all of their belongings, or, as in the most recent flooding, a little boy drowned during the calamity. 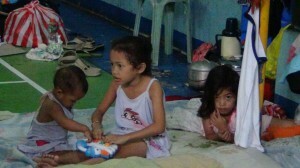 These people, about 1,500 of them, live in the community of Brookside, Bagong Silangan (BS), Quezon city, Philippines. Pictures above were taken during and after they experienced a two-day floods, after a “Habagat”(Monsoon rains) passed by their community last August 7th-8th, 2012. As good Christians, we believe that ADVENT IS A SEASON OF HOPE and it behooves us to give hope by sharing our blessings with our less fortunate brothers and sisters. Shall we give a little relief and joy to the people of BS? As a Christmas present, shall we provide them their NOCHE BUENA next month? (Noche Buena is a Filipino tradition of the family gathering for a simple feast after prayers, on the eve of Christmas). Also, would you kindly tell your relatives and friends about this plan? All donations shall be acknowledged promptly and are tax deductible in USA. May God return your generosity a hundredfold and bless you and your family! It was a Tuesday and I was not supposed to go back to Cubao that day, but I decided to go since I was coming down with a very bad cold. That was in the afternoon. That night, the fury started. With torrential rains, it poured down without let up. I was glued on the television watching how the “habagat”, which is not even a typhoon, unleashed its fury. I was in panic and never left the cellphone communicating with the leaders on what is happening. The leaders assured me: “Sister, don’t worry, sanay na kami dito. Just get well fast so you could come”. I could not go there fast, as I was told by the doctor I am having pneumonia and need complete rest! The ravages of the habagat left the retaining wall of the entire creek broken down. This was only built in 2009 after the historic Ondoy typhoon. The creek runs along the entire Bagong Silangan filled with thousands of resettled squatters. That is why the flood rushed so fast to the community, first breaking down the wall of the school, then flooding the houses till the roofs. Many have lost their own walls, their ceilings, destroyed their appliances, their clothes and other possessions. What was so unfortunate was, after two days, the flood which reached till the waist subsided in the morning. So,thinking that was it, the people started to clean up and put back their things only to be washed again, this time with flood reaching till the roofs. The books of the library were all destroyed as they just put them up higher which were also reached by the floods! As it was during Ondoy typhoon, the flood threatened to engulf the main road but luckily it stopped just right on the doorstep of our house! Just the same, the leaders put all the things of our house upstairs on the second floor. What a mess when I arrived! All the reference books of the children whether left in the school or brought home were all destroyed and to think this is only August, meaning they just got them last June courtesy of Stella Maris College. A mother was crying when she told me the story of her small boy who desperately wanted to dry his notebooks and said, “Ma, i want to dry them so I can copy my notes …our exam is approaching”. I thought no amount of calamities can quench the desire of these children for learning! Thanks be to God. I asked them to please save the books by drying them. So they brought all of them to the basketball court to dry but… the children had the time of their lives… playing with the books! Their laughter and frolicking turned my exasperation to hope… that yes, they are used to this… and will survive! What resiliency! The poor are God’s favorite indeed! True enough when I reviewed their history, the place suffered floods so many times. They arrived there in 1997 but the flooding started in 2004 (till waist), 2007(till waist), 2008(till waist), 2009=2x floods, first till waist, then, in September, the big one, Ondoy, till the roof; 2001- till waist, and now 2012, till the roof! Who won’t get used to floods with these experiences?!! The history of flooding in Bagong Silangan truly reflects what is happening in the entire country – the destruction of nature and the revenge of Mother Earth and the critical need to address this issue not only in Bagong Silangan but for the entire country and for that matter, the entire planet! One very unfortunate thing was one of the Kindergarten students died while being rescued. The school had a memorial service for him. The sad story was after Ondoy in 2009, due to the precarious location of their house, they were already offered to be relocated; many of their neighbors went but they refused and stayed on. I felt helpless that I could not go there even after the flood as I was told to rest and I had to go to GMA(hospital) to recover. Fortunately, some of our FMM sisters went to express solidarity with them and I was monitoring the delivery of relief goods. Sad to say, there was “donor fatigue” already as this has happened so many, many times already. When I finally went back, we started to rebuild the school wall which was finished in no time. 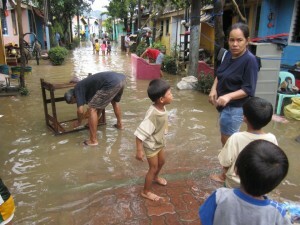 Inspite of their losses, the people gave their time for “bayanihan” and contributed two hollow blocks per family. Thanks be to God we can also replace the books in the library and perhaps build a second floor to put the books there through the help of other benefactors. When I arrived, the school has been cleaned totally with the help of the Barangay and GK. Still all the belongings of the people, i.e. appliances, furnitures were all strewn on the streets for drying…Unfortunately, still the sun did not come up yet. What is fortunate, at least, the sun is still shining in the hearts of each one.. not losing hope…I still see them smiling, as if just a normal thing happened…Talagang sanay na sanay sa hirap! After this, we had analysis, evaluation, discussion, reflections on our lessons. One woman said, “Now, i only keep a few clothing… what is essential only…” And to think, it came from a poor woman who does not really have anything superfluous?! I wondered how many did she have before and how many is she keeping now? We tried to discuss long lasting solutions to this perennial problem – relocation – where shall we go Sister ?..We have nowhere to go..Even if we could transfer to another place, we see they are also being flooded anyway; to build second floor – where do we get the money, Sister? so we just content ourselves with our postponed disaster preparation program which was interrupted by another disaster. That means = emergency lights, lifejackets, barge or boat, ropes, plastic to protect documents, better organization, swimming lessons for our youth – courtesy of Bert Lozada Swimming school. Yes, small survival techniques till we could come up with better solutions…..God have mercy …. Now, I am writing this in the month of October and they have started their yearly ritual of Dawn Rosary for the entire month. I was shocked to learn that they are doing this for a whole month… waking up at 3:30am and starting to pray the rosary at 4:00am in procession in all the seven streets covered by the association. So with this, they offer their dawn rosary especially for the intention of asking pardon for their faults in abusing our Mother earth and asking for God’s protection but promising to be more responsible in our dealing with our surroundings – our garbage, cleaning up of canals and drainage, etc. When Sister Avelina Alcaneses learned that I am now assigned in Bagong Silangan, she told the sisters, “Ah, she will be like fish in the water!” Truly, because although the heat and travel wearies me a lot, I am actually enjoying my journey with the people in Bagong Silangan. Very challenging indeed; but a real singular blessing of being able to continue to journey with the poor, God’s favorite! To our benefactors who lent a hand to Brookside, Bagong Silangan, in our time of need, our heartfelt thank you! God bless you all!